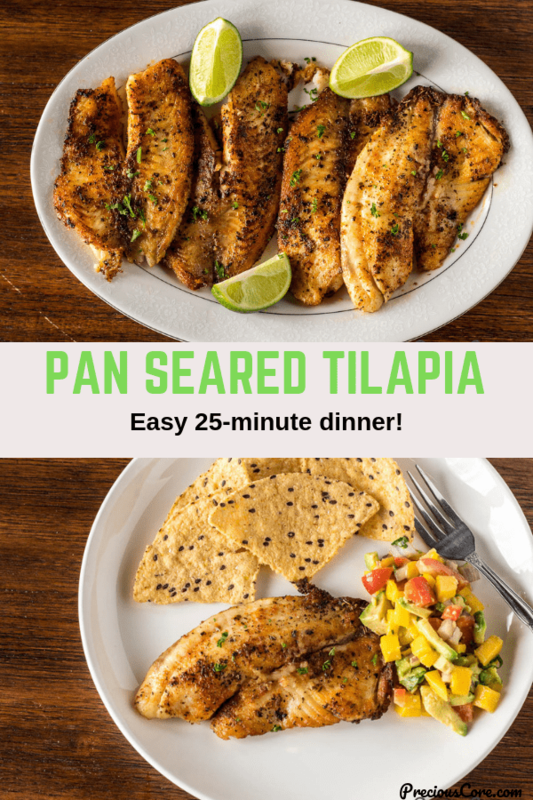 This Pan Seared Tilapia is a super easy 25-minute dinner that is perfect for busy moms like me. The fish is lightly crusty on the inside and flaky on the inside. Serve this with my Mango Avocado Salsa and you will be in heaven! 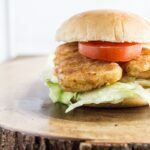 I am totally having fun with looking for meal ideas that I can execute in about 30 minutes! 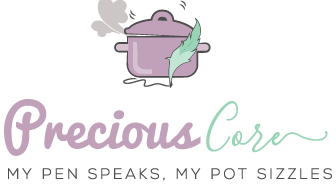 As a busy mama, it is my goal to make family-friendly meals that do that require hours and hours of cooking! 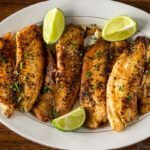 So this Pan Seared Tilapia is right up my alley! 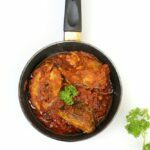 You do not need to coat the tilapia in flour before frying and you only need a few easy healthy ingredients. All you need is some fillets (they should be completely defrosted), garlic powder, basil, paprika, black pepper, salt, and olive oil. This combination of seasoning makes the fish taste so good! I always keep a lot of dry ingredients at home and you totally should do the same. 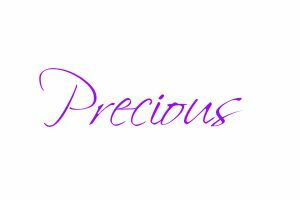 They make life so easy! Step 1. Rub the spices all over the fish. Be sure that the spices get to every nook and cranny of the fish. 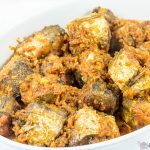 There is no need to let the fish marinate first. Step 2: Heat up some oil in a skillet. Preferably use a cast iron skillet if you have one but any other skillet will do. Once the oil is hot, place two fillets in at a time. Cook for about 4 minutes on each side. Sprinkle with some chopped parsley as a garnish if you want to be a little extra! Also add some lime wedges on the side for squeezing over and enjoying. So good! 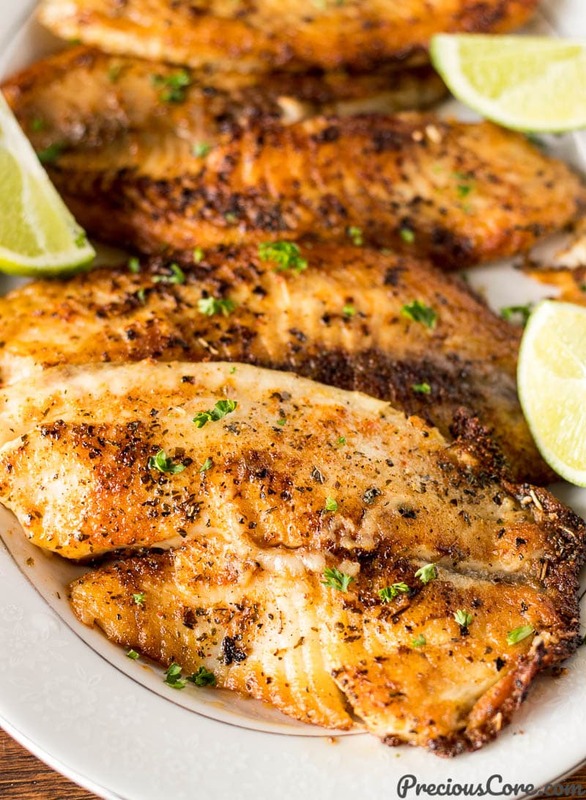 Two easy steps and you have insanely good Pan Seared Tilapia! I could eat all of this fish in one sitting, I tell you. It is super flavorful. 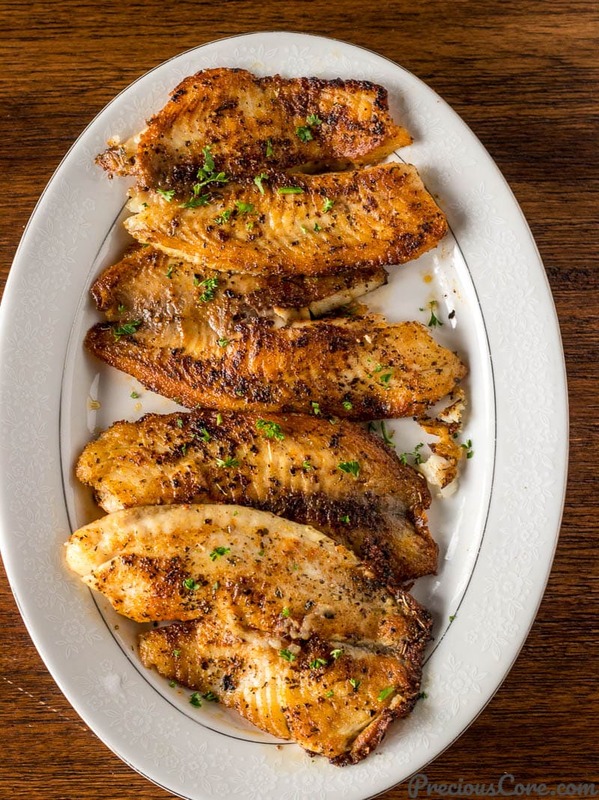 The blend of ingredients I use on them transforms boring tilapia to a restaurant quality dish. My whole family goes crazy for this! I strongly suggest you double the recipe if cooking for 4 or more people. In the unlikely event that you have leftovers, place them into a bowl with a tight fitting lid and store in the fridge for an easy grab-and-warm lunch or dinner. 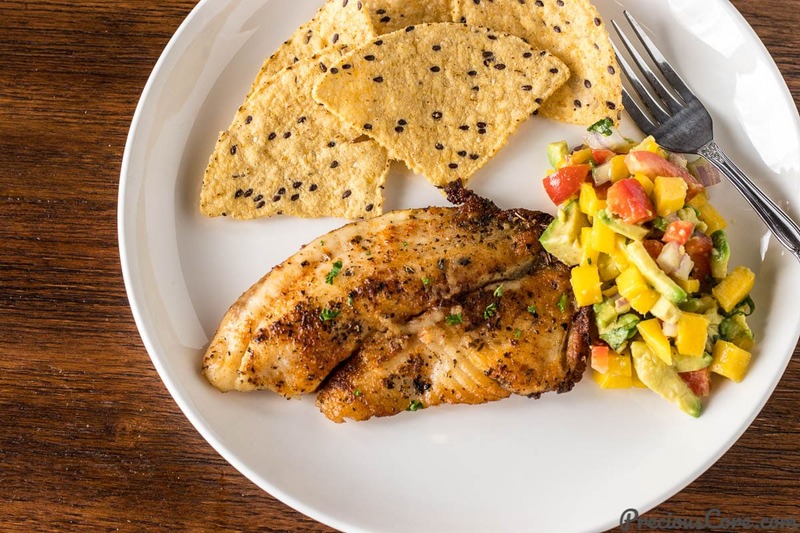 This Pan Seared Tilapia goes so well with my Mango Avocado Salsa! I enjoyed the fish and salsa with some corn chips on the side and I loved it! 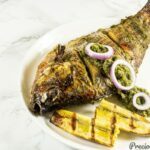 Serve it with some boiled rice, couscous, some fried plantains, some potato fries, break up the fish and serve in tacos or serve with any side dish you enjoy! Hope this recipe brightens your life in the kitchen as it did to mine! 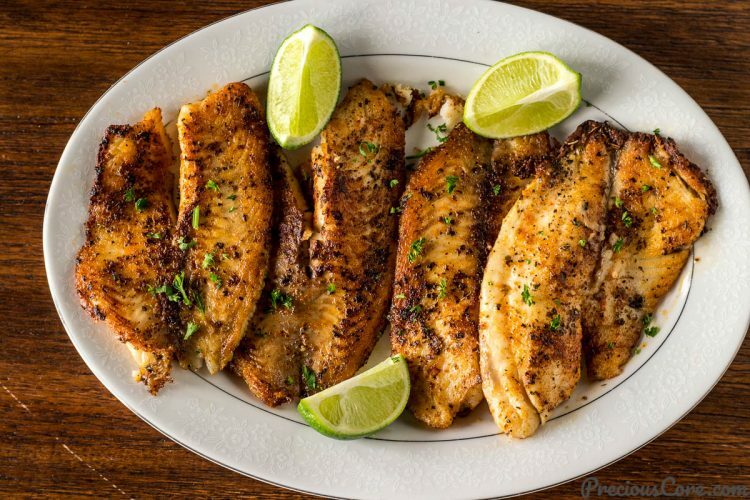 This Pan Seared Tilapia is a great way to cook tilapia fillets to taste really good! Trust me, you will want to double this recipe. I tested the recipe using 1 pound of fillets but my family of 2 adults and 3 kids finished 2 pounds at one go! The fish is out-of-this-world good! 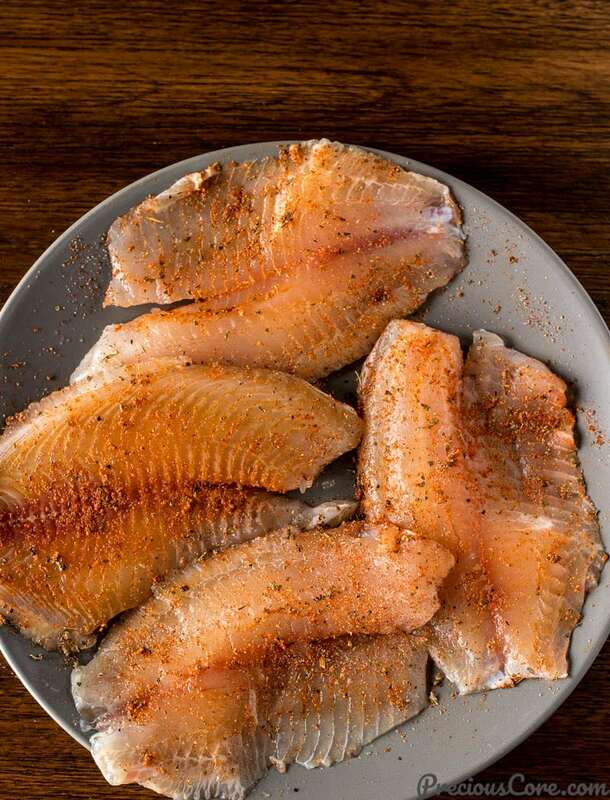 Place fillets on a large plate then rub the salt, pepper, garlic powder, paprika, dried basil and olive oil all over them. In a skillet (preferably cast iron) heat 1 tablespoon of oil on high heat for about 3 minutes. Turn down the heat to medium then add two fillets to the pan. Let them cook on one side for about 4 minutes then flip to the other side and let them cook for another 3-4 minutes. Repeat the process with the remaining fillets and oil. 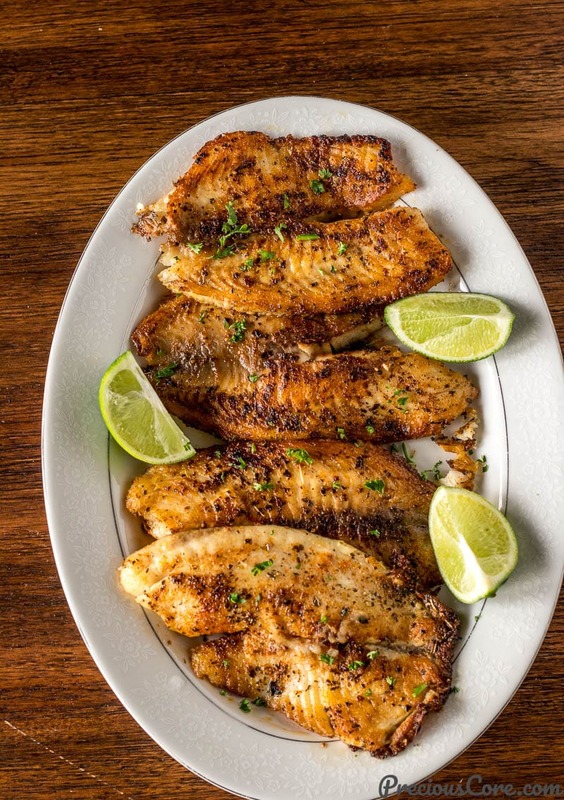 Serve warm with some lime wedges on the side for squeezing over the fish as needed. I love to serve this fish with my Mango Avocado Salsa on the side! You could also break it up and use in tacos or serve with any side dish you like. Enjoy, friends! 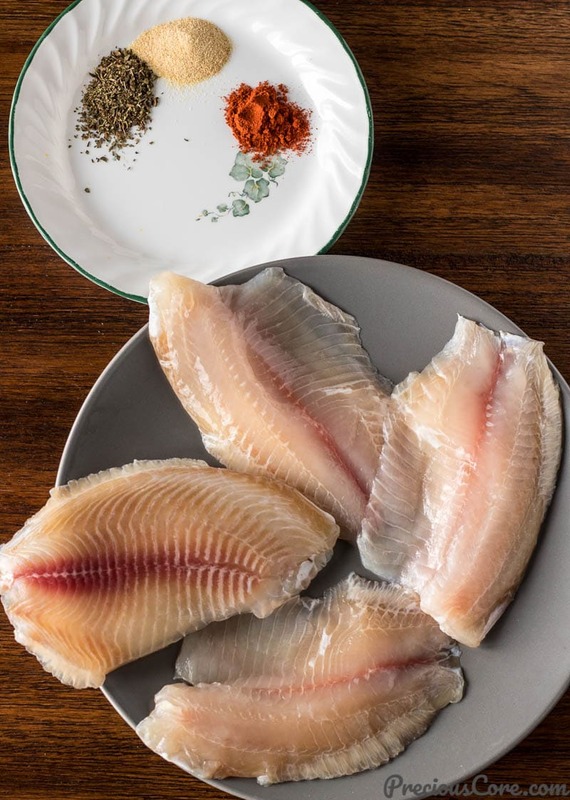 Use completely defrosted fillets for this recipe. I defrosted my fish in the fridge for 24 hours but you can all place the fish fillets in a Ziploc bag then place in a bowl of water to quickly defrost. Defrosting the fish completely ensures that the fillets cook evenly. Great pictures and most importantly, the recipe is very easy to follow. Awww, thank you so much, Ajoke. I really appreciate your comment.